Genesee Community College is readying for the first-ever Homecoming celebration on October 1-2, 2010. The committee of 10 Genesee alumni, including chairs Patti Michalak ’70 and Pam Whitcombe ’69, is putting the finishing touches on an exciting weekend filled with alumni activities. All graduating classes as well as family members, friends and the community are welcome to the College’s Batavia Campus for a weekend filled with alumni activities, sporting events and at the culmination of the weekend, an All-Class Cougar Reunion/Mixer in the Forum. Part of the Homecoming weekend activities include raising money for the American Cancer Society. A refurbished iron bath tub was recently placed in the Student Union to collect spare change from students, faculty and staff to be donated to the American Cancer Society of Buffalo. The “Making Strides Against Breast Cancer Walk” will take place on Sunday, October 3 and all monies collected will be donated to the cause. The bathtub collection is a tradition passed down from GCC students back in the 1970’s according to John Michalak ’73, Homecoming Committee member. Friday, October 1 will feature men’s and women’s Alumni soccer games played under the lights of the new all-weather turf field. Women players are still needed and are encouraged to sign up at www.genesee.edu/gcc/alumnisoccer . Saturday, October 2 will begin with various alumni-centered activities and celebrations across the campus including campus tours, reunions and an alumni brunch. The Men’s and Women’s Cougar Soccer teams will play at 12:00pm and 2:00pm versus North Country Community College. Following the Cougar soccer games, the first group of inductees will be welcomed into the new Athletic Hall of Fame with an induction ceremony and celebration at 5:00 PM in the Conable Technology Building. Homecoming weekend will conclude with an All-Class Cougar Reunion/Mixer open to all alumni and community members. All graduating years are invited, with special recognition for the classes of 1969 and 1970 and a featured event theme of the “Hippie 60’s.” There will be music, prizes, food and a cash bar. The cost for the Mixer is $5 per person. Further details on locations, times and additional alumni activities are available by going to www.genesee.edu/Alumni/Homecoming . To volunteer for the Homecoming weekend, please contact Alumni Affairs Coordinator Jackie Christenson at 585-343-0055 x6265 or jkchristenson@genesee.edu. 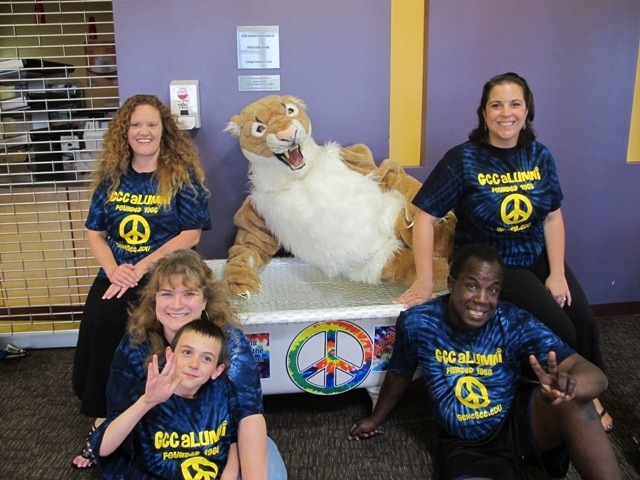 Homecoming Committee members and the Cougar mascot with the bathtub collecting change for the American Cancer Society in GCC’s Student Union. Back row: Lori Smith ’89, the Cougar and Kate Edwards ’04. Front Row: Kelli Sperino-Pease ’88, James Pease, and Jason Reese ’88.